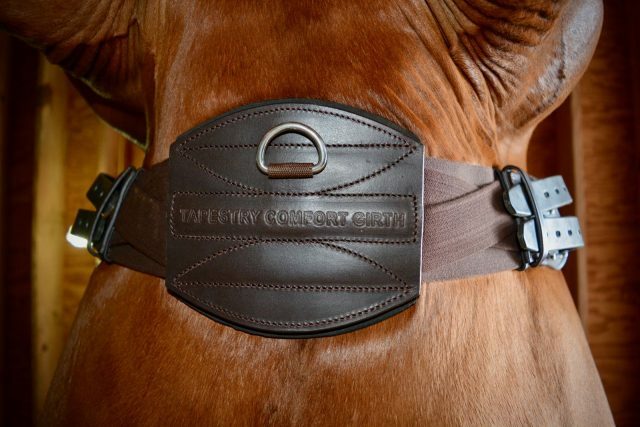 The Tapestry Comfort Girth is designed to relieve pressure points. Photo by Kate Samuels. As technology expands in our equine world, and our ability to understand how the horse’s body works increases with scientific discoveries, it’s inevitable that we begin to “reinvent the wheel” with the tools that we use for training. We have been using the same plain old strips of leather to tie a saddle onto a horse for many, many years, but suddenly we’re able to improve upon the method. The latest in girth technology comes to you from the inventor of the Spursuader, and it’s called the Tapestry Comfort Girth. Tapestry Equine Products is known for their unique approach to creating tools to help us train our horses better, and they specifically focus on comfort from the equine perspective. Therefore, it’s no surprise that they decided to create an ergonomic girth designed to help you and your horse perform better on a daily basis. These days, we know that using a thin, inflexible leather girth and tightening the heck out of it doesn’t really help your horse relax and use their bodies in the best way. In fact, it can make a lot of horses really uncomfortable and reduce their ability to extend their front legs, and relax their core. Therefore, we now have girths like the Tapestry Comfort Girth designed specifically to avoid this kind of situation. The sternum pad sits directly in the center of the horse. MAD PROPS for my photo skills here, guys. Photo by Kate Samuels. When I first got this girth, I was immediately intrigued by the design. It has a 6″ sternum pad with non-slip neoprene and the buckles are connected to that with several pieces of lightweight but sturdy elastic. It folds up and takes up almost no room in the tack trunk, and you can also squirt it off after a ride, so it gets points for convenience. This sternum pad is unique to the Tapestry Comfort Girth. The non-slip neoprene keeps the girth in place, while also promoting equal distribution of pressure when the girth is tightened. There is a D-ring attachment for martingales and breastplates, although they would have to be the type with a clip of their own. 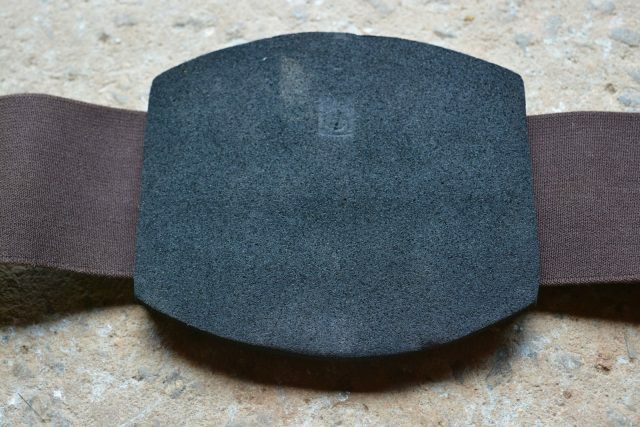 The sternum pad has spongy and comfortable non-slip neoprene on the inside. Photo by Kate Samuels. The elastic webbing has two layers, with one solid wide piece and two smaller ones criss-crossed that overlay and distribute pressure evenly. The horse’s ribcage does the most expansion when breathing, therefore it is important to have the elastic in this location, and it minimizes the restriction caused by the girth. I would definitely recommend this girth for horses who have very narrow spaces behind the front leg for the girth, as it is spac- efficient without being uncomfortable. I used this girth on a horse who regularly shows mild signs of discomfort when I tighten the girth (no matter how slowly), and was pleased to see that he was markedly less bothered when I tightened this one. The synthetic leather provides ample coverage for the buckle area. Photo by Kate Samuels. The elastic is then in turn connected to high quality synthetic leather that provides ample coverage for the two stainless steel buckles. 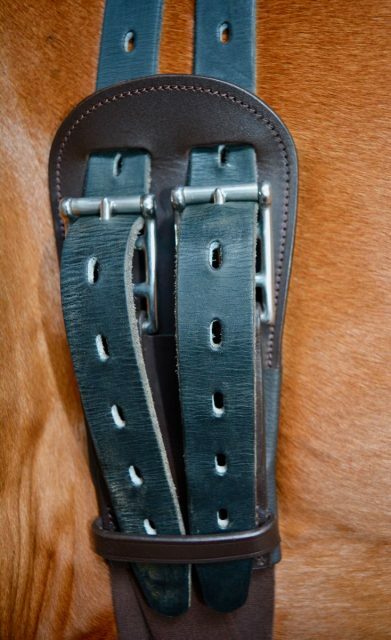 There is also a slot provided for the billets to go through on their way to the buckles, which ensures that the girth doesn’t change position when tightened. I will say that one of my saddles had slightly thicker billets, and they did not fit through the slots, but they worked fine for my other saddle. The keeper for the billet ends is somewhat further down the girth than some others, as you can see from the photo above. 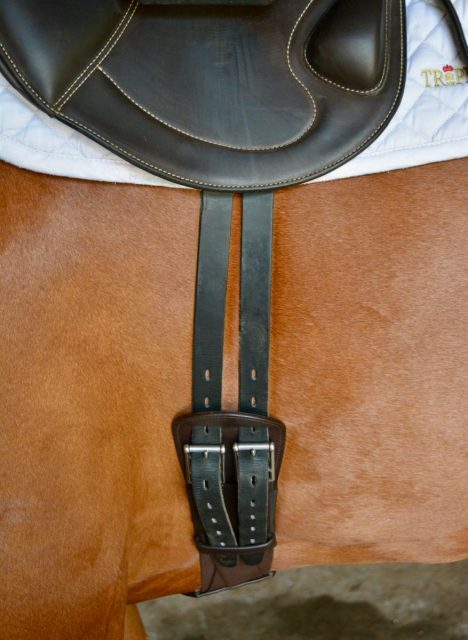 My girth had to be on at least the sixth hole in order to tuck in the end pieces, so I would suggest erring on the side of one size too big when ordering this girth for your horse. The lines of this girth are very neat and tidy and unobtrusive. Photo by Kate Samuels. Overall, I would recommend the Tapestry Comfort Girth for horses that are sensitive about their sternum, exhibit girthy behavior, or tend to hold tension in their ribcage and front legs. It seems to be quite comfortable for them, and is easy to use and care for. It is available in monoflap length, double flap length, and they even have a western version as well. Click here to order.